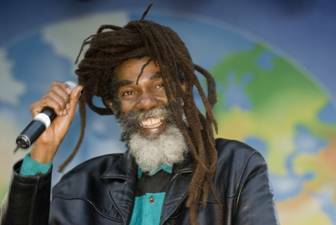 Veteran reggae artist Don Carlos is slated to do the Bob Marley Day shows in southern CA and Mexico Feb. 2010. In March he tours Europe, and in April he tours South America. June he does Costa Rica, and then he is scheduled to commence a full North American tour. Don has a new CD out called Changes, that was released January 2010 and is selling fast. In 2009 Don also toured Europe and South America. April 2009, he toured the western U.S, where he is currently one of the most popular reggae artists, and in August he headlined the Monterey Bay Reggaefest. Don’s band is in good form, with luscious female harmonies, sharp decisive horn phrases, classic songs and solid engineering by Loren Miller – his front of the house engineer. Don’s spirit is positive and his crew is well worked in. In 2007, Don toured Poland, Austria, Portugal, Spain, Holland and France in Europe. On the festival circuit he played Earthdance, in northern CA, The Sierra Nevada World Music Festival, Reggae Rising, Music in the Park in San Jose, CA, The Monterey Bay Reggaefest, the Upsalla festival in Sweden, the Reggae Sundance in Holland, and the Reggae Summerjam in Germany. Sly and Robbie backed him on Reggae Rising prime time Saturday night. Don has also been touring Hawaii regularly, where he headlined the Bob Marley Day festivals February 2007 on all four of the major Hawaiian Islands. Don is a melodic singer whose classic songs are well arranged and executed live. He is a mature artist, definitely one of the nicer and more genuine singers in the reggae business. His band has remained consistent for the past eight years. Don’s gentle contented spirit is a comfort to his friends and fans. There is a class about him as an artist that promoters and venue owners take pride in. On the recording side, Don spends much of his time in the recording studio. He has out seven albums with Ras records, and at least nineteen other releases on different labels. These titles are listed on his biography. Don recorded four albums with Black Uhuru for the Mesa Blue Moon label, and toured with Black Uhuru as lead vocalist from 1989 – 1994. In his music, Don speaks for all people. He talks about peace and love, generosity and righteousness. He doesn’t leave out thanking Jah for everything. “I love you and Jah loves you more”, he says. “Love Jah, and you will have everything – all wisdom.” Don has a big heart and a kind loving spirit. He is a special artist. Because of his blessings, the multitudes are drawn to him. You can watch a video clip of Don performing live at the Maritime Hall, San Francisco, in the late 90’s at the following link:http://youtube.com/watch?v=dx8TApMj4lQ. Don Carlos (born Euvin Spencer) Legendary Reggae Artist was born and raised in one of the most deprived regions of Western Kingston, Jamaica, in a district notoriously known as Waterhouse, which incidentally is also a musical spawning ground for many of Reggae’s greatest ever talents, such as King Tubby, Black Uhuru, The Jays, Junior Reid and King Jammy, to name but a few. Don Carlos started his singing career in 1973 as one of the original members of Black Uhuru, alongside other founding members, Garth Dennis who later went on to joining the Wailing Souls, and Derrick Ducky Simpson. As part of the trio, Don sang lead on the highly acclaimed Love Crisis album, for producer Prince Jammy in 1977. This album was later re-released and re-titled as Black Sounds of Freedom. A year after the trio’s groundbreaking debut, Don Carlos surprisingly decided to leave Black Uhuru in pursuit of a solo career. Within three years as a solo artist, developing his song writing and grooming his distinctive vocal style, in May 1981 Suffering was released. This strong release took the fraternity by storm, courtesy of a heavy roots and culture flavored showcase for the Negus Roots label. This album was a massive hit in Africa, selling unprecedented units. Unfortunately, the album was bootlegged, and Don never received proper royalties. At this time, he worked alongside Goldie, his sidekick, co writer, and back up vocalist. Together they built a staunch following through touring the live circuit and releasing consistant albums including Harvest Time, Day to Day Living, Them Never Know A Natty Dread Have Credentials, all three issued in 1982, Spread Out 1982 also otherwise known as Laser Beam to which the majority of tracks in this set have been culled, Never Run Away 1984, Just a Passing Glance 1985 and more recently Seven Days a Week. Don’s partner, Gold was tragically shot and crippled, putting him out of the music business. During the eighties dance hall mania, Don had five top ten hits between 1982 – 1985- Late Night Blues, Nice Time Tonight, Dice Cup, Hog & Goat, I’m Not Getting Crazy and Spread Out. Don is still churning out solid, melodic roots reggae. Other titles in his rich catalogue include Roots and Culture, Raving Tonight, Pure Gold, Spread Out, Plantation, Never Run Away, Slow Down Vol. 3, Rasta Brothers, Prophecy, Firehouse Clash, Deeply Concerned, Ease Up, Lazer Beam, Ras Portraits, Grove w/me, Head to Head, Jah Light, Live in San Francisco (2002), and Special Edition. There’s an old saying in the music industry that claims: What goes around, comes back around. In Dons’ case, a request for reinstatement to his former role as lead vocalist for a rejuvenated Black Uhuru reunion resulted in another strong Black Uhuru album – Now. 1990 marked the reunion of the original vocal trio with Don, Garth and Duckie. After six years- 1989-1994- and four albums, singing lead for Black Uhuru in the studio, and on the road, Don again went back to his solo career. His other titles with Black Uhuru include Mystical Truths, Iron Storm andStrong. All of these four albums are classics with Don up front on lead vocals. After the Black Uhuru stint, Don joined forces with the California based Reggae Angels for four successful years, and then kept some of the core players for his own permanent backing band. He has been touring successfully with this band in Europe, South America, Hawaii, and the western US. Don’s popularity has been consistently growing, so he is now one of the most sought after roots reggae artists in the business. Check him out online at www.doncarlosreggae.com or at http://doncarlosinternational.com/.